Bodum Chambord is famed for many things. The looks, for starters, will make you beam with pride. You’ll surely want to display it like a trophy on your countertop instead of tucking it away when not in use. Then comes the bang for your buck, which is, quite frankly, impressive. Scroll down and discover just how impressive it actually is. Hardly any component of Bodum Chambord include plastic. Surprisingly, even the lid is in steel – making the entire frame live much longer than plastic-made French presses. It’s also solid enough to keep the glass carafe firmly in place. Speaking of the glass carafe, we were surprised to find how well it resists heat. By saying so, we didn’t mean that it’d keep coffee hot as long as a stainless steel carafe, but long enough to beat the majority in its category. As far as glass goes, this carafe is pretty strong. However, make sure you don’t use boiling water directly to brew coffee – if you want to avoid possible breaks that is. When it does break, however, which will eventually happen with all glass French Presses, you can easily find replacement carafes. If you’re under the warranty, you’ll get one for free. As expected, the brewing process takes a couple of minutes, which in return ends up extracting most of the flavors that’ll taste wonderful on your tongue. Make sure you provide the French Press with coarse grounds of coffee beans to keep them strained out. The filter does a pretty good job at this. It can handle almost all grounds, and produce coffee with one of the smoothest textures ever. Compared to a Drip machine, cleaning a French Press isn’t easy. This actually is a fact. So don’t expect the Bodum Chambord to have any supernatural cleaning mechanism. You have good news! The French Press is dishwasher safe and the carafe comes out of the frame with a strong yet simple tug. You can quite easily have it washed in under a minute. However, do keep in mind to be extra careful because the carafe is made up of single-walled glass. Don’t expose it to sudden temperature changes. If it’s warm, make sure not to hold it under running water. Wait until it has cooled down or simply use warm water to rinse it clean. Unlike some French Presses, it’s possible to make coffee for one person using Bodum Chambord. All you need is to fill it up with the required water and push the plunger. It’ll brew you just the perfect cup, regardless of the quantity. If used with care, this French Press will turn out to be the last one you’d ever buy. For your information it boasts about being made in Portugal under quality craftsmanship. The best part about this French Press is that it can be used by anyone on the market for a French Press. Though it isn’t the first choice for a portable French Press, it still can be carried safely in your backpack. If you’re a person who brews coffee in advance, then make sure you have a thermal carafe with you. Glass carafes are not the ones to keep coffee at a serving temperature for long. You can’t make 8 cups from this French Press – Period! Some even claim that it doesn’t hold more than 16 ounces – which is actually half the advertised amount. If your family has more than a couple of coffee snobs, queuing to have their own mug brewed, then this isn’t the French Press you should be buying. Instead buy the one with 51 ounces, or aim for another model like the KONA or the SterlingPro. 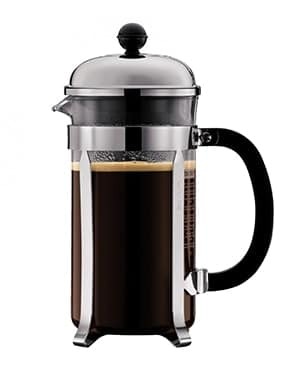 This isn’t the best French Press the market has seen, yet one of the best in terms of the overall value. In fact, it comes in handy with delicious coffee-making skills, fine quality and attractive looks. Be rest assured that it’ll serve you for many years to come.